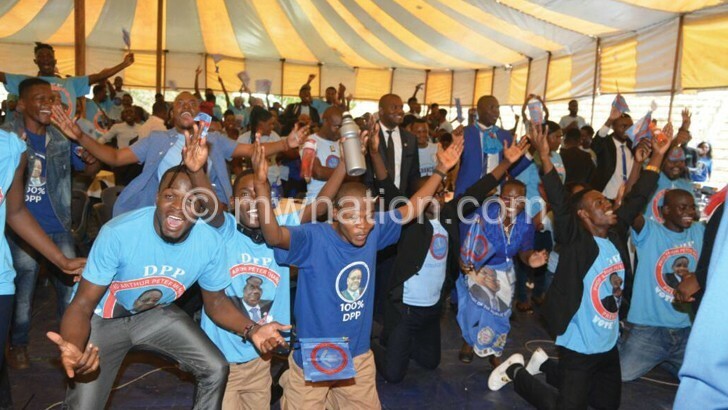 Democratic Progressive Party (DPP) college wings are split on the endorsement of President Peter Mutharika as the party’s presidential candidate in the 2019 Tripartite Elections. In an interview yesterday, DPP National Students’ Union chairperson Gerald Mgala, a student at Malawi College of Accountancy (MCA), said the reported endorsement has stirred trouble among college wings, especially those who did not attend the Sanjika Palace meeting. He said: “Our visit [to Sanjika] was not normal. It was like an emergency. Instead of inviting us through our national executive committee, the organisers were just calling [college] wing chairpersons directly to select who to attend. The students endorsed Mutharika as the DPP torchbearer on Sunday evening at Sanjika Palace in Blantyre where the President accompanied by some senior DPP officials hosted a luncheon for the 1 200 university students. During the function, the President also gave out K24 million to the students who got K20 000 each, according to some attendees. Mutharika, 79, is facing an unprecedented resistance, for an incumbent eligible for a second term as per the Malawi Constitution, from a section of his governing DPP lobbying for the candidacy of Vice-President Saulos Chilima, 45. Former first lady Callista Mutharika—widow of DPP founding president and the incumbent President’s elder brother, Bingu wa Mutharika—sparked the succession debate weeks ago when she said her in-law should pave the way for the comparatively youthful and energetic Chilima widely seen as a hands-on and results-oriented leader after he vibrantly led the Public Sector Reforms Programme that has lost steam since it was moved from his domain. The President’s gesture, therefore, to host the college youths was widely seen as an offensive to counter Chilima’s purported influence on youthful voters who form the majority of the population. Chilima has remained silent on calls for him to vie for the presidency. Yesterday, his spokesperson Pilirani Phiri maintained that the Vice-President has no comment on the issue. Mgala said college wings invited to the meeting were from University of Malawi constituent colleges of Chancellor College, the Polytechnic and College of Medicine; Domasi College of Education, Malawi University of Science and Technology (Must), Mulanje Mission College, Malawi College of Health Sciences and Blantyre International University (BIU). Two political commentators have urged Mutharika to dare his challengers to a convention where the party’s membership can choose a torchbearer. Mustaffa Hussein, a political analyst based at Chancellor College, said the President’s gesture was meant to win sympathy from the youth. But he said the convention is the right forum to earn fresh mandate as per DPP constitution. In a separate interview, Mzuzu-based political commentator George Phiri said some people have lost trust in the youth as they are just being used by politicians. He said he expected the college students to appreciate the process of endorsing a party presidential candidate. Put to him that elsewhere, including in the United States of America, incumbent presidents are not exposed to such fresh intra-party endorsement for a second term, Phiri said DPP should follow its constitution. Presidential adviser on youth affairs Symon Vuwa Kaunda, one of the DPP officials who attended the gathering, referred The Nation to presidential press secretary Mgeme Kalilani who said he was not aware of the union chaired by Mgala. There is divided opinion on the DPP 2019 torchbearer with some officials openly pushing for Chilima’s candidacy and others declaring Mutharika will go unopposed at the convention. Some observers see the development as a vote of no confidence in Mutharika from within his party. Mutharika has personally declared that he will lead DPP in the elections, saying fielding a different candidate would oust the party from power.